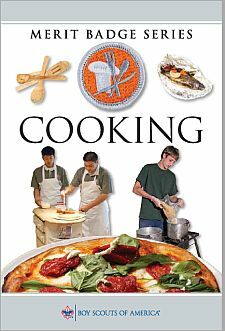 Note: The meals prepared for Cooking merit badge requirements 4, 5, and 6 will count only toward fulfilling those requirements and will not count toward rank advancement. Meals prepared for rank advancement may not count toward the Cooking merit badge. You must not repeat any menus for meals actually prepared or cooked in requirements 4, 5, and 6. Show that you know first aid for and how to prevent injuries or illnesses that could occur while preparing meals and eating, including burns and scalds, cuts, choking, and allergic reactions. Describe how meat, fish, chicken, eggs, dairy products, and fresh vegetables should be stored, transported, and properly prepared for cooking. Explain how to prevent cross-contamination. Discuss with your counselor food allergies, food intolerance, and food-related illnesses and diseases. Explain why someone who handles or prepares food needs to be aware of these concerns. Discuss with your counselor why reading food labels is important. Explain how to identify common allergens such as peanuts, tree nuts, milk, eggs, wheat, soy, and shellfish. Explain why you should limit your intake of oils and sugars. Determine your daily level of activity and your caloric need based on your activity level. Then, based on the MyPlate food guide, discuss with your counselor an appropriate meal plan for yourself for one day. Discuss your current eating habits with your counselor and what you can do to eat healthier, based on the MyPlate food guide. Discuss the following food label terms: calorie, fat, saturated fat, trans fat, cholesterol, sodium, carbohydrate, dietary fiber, sugar, protein. Explain how to calculate total carbohydrates and nutritional values for two servings, based on the serving size specified on the label. Discuss EACH of the following cooking methods. For each one, describe the equipment needed, how temperature control is maintained, and name at least one food that can be cooked using that method: baking, boiling, broiling, pan frying, simmering, steaming, microwaving, grilling, foil cooking, and use of a Dutch oven. Discuss the benefits of using a camp stove on an outing vs. a charcoal or wood fire. Describe with your counselor how to manage your time when preparing a meal so components for each course are ready to serve at the same time. Cooking at Home. Using the MyPlate food guide or the current USDA nutrition model, plan a menu for three full days of meals (three breakfasts, three lunches, and three dinners) plus one dessert. Your menu should include enough to feed yourself and at least one adult, keeping in mind any special needs (such as food allergies) and how you kept your foods safe and free from cross-contamination. List the equipment and utensils needed to prepare and serve these meals. Create a shopping list for your meals showing the amount of food needed to prepare and serve each meal, and the cost for each meal. Share and discuss your meal plan and shopping list with your counselor. Time your cooking to have each meal ready to serve at the proper time. Have an adult verify the preparation of the meal to your counselor. After each meal, ask a person you served to evaluate the meal on presentation and taste, then evaluate your own meal. Discuss what you learned with your counselor, including any adjustments that could have improved or enhanced your meals. Tell how better planning and preparation help ensure a successful meal. Using the MyPlate food guide or the current USDA nutrition model, plan a menu for your patrol (or a similar size group of up to eight youth, including you) for a camping trip. Your menu should include enough food for each person, keeping in mind any special needs (such as food allergies) and how you keep your foods safe and free from cross-contamination. These five meals must include at least one breakfast, one lunch, one dinner, AND at least one snack OR one dessert. List the equipment and utensils needed to prepare and serve these meals. After each meal, have those you served evaluate the meal on presentation and taste, and then evaluate your own meal. Discuss what you learned with your counselor, including any adjustments that could have improved or enhanced your meals. Tell how planning and preparation help ensure successful outdoor cooking. Explain to your counselor how you cleaned the equipment, utensils, and the cooking site thoroughly after each meal. Explain how you properly disposed of dishwater and of all garbage. Discuss how you followed the Outdoor Code and no-trace principles when preparing your meals. Using the MyPlate food guide or the current USDA nutrition model, plan a menu for trail hiking or backpacking that includes one breakfast, one lunch, one dinner, and one snack. These meals must not require refrigeration and are to be consumed by three to five people (including you). Be sure to keep in mind any special needs (such as food allergies) and how you will keep your foods safe and free from cross-contamination. List the equipment and utensils needed to prepare and serve these meals. Create a shopping list for your meals, showing the amount of food needed to prepare and serve each meal, and the cost for each meal. Share and discuss your meal plan and shopping list with your counselor. Your plan must include how to repackage foods for your hike or backpacking trip to eliminate as much bulk, weight, and garbage as possible. After each meal, have those you served evaluate the meal on presentation and taste, then evaluate your own meal. Discuss what you learned with your counselor, including any adjustments that could have improved or enhanced your meals. Tell how planning and preparation help ensure successful trail hiking or backpacking meals. Discuss how you followed the Outdoor Code and no-trace principles during your outing. Explain to your counselor how you cleaned any equipment, utensils, and the cooking site after each meal. Explain how you properly disposed of any dishwater and packed out all garbage.